Elon Musk has plans for future Martians. In a Reddit Ask Me Anything Q&A session on Monday, Musk outlined plans to build a gargantuan spaceship that could transport material and colonists to Mars. He wrote that he hopes to unveil blueprints for the transport system and a chic astronaut suit later this year. Back in June, Musk, who founded and serves as both chief executive and top technology officer of the private space travel company SpaceX, said he hopes to send humans to the red planet by 2026. Humans might be waking up on Mars in the near future thanks to Elon Musk. Founding a settlement on another world will be an arduous task. The sheer mass of all of the materials and humans needed to initially set up the colony would reach about 100 metric tons, Musk wrote Monday. “This obviously requires a very big spaceship and booster system,” he said. That will take time. SpaceX delayed an ambitious experiment on Tuesday morning to test its reusable Falcon 9 rocket booster, which would blast materials into space but land back on Earth on a floating platform. NASA reported that the launch has been rescheduled for Friday. But the company is definitely making progress. The design for a new spacesuit is “finally coming together,” Musk said during the AMA. Musk has said that he considers colonizing Mars necessary to the survival of the human species. It may be Musk’s namesake destiny to lead humanity to Mars. After Musk said he would be “unlikely” to ever enter politics, one Reddit commenter suggested nominating him to become king of Mars. 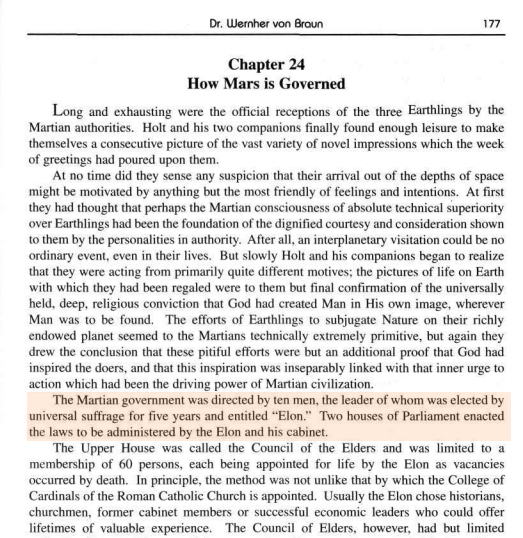 In response, another commenter posted a screenshot from a chapter of Dr. Wernher von Braun’s 1952 science book The Mars Project, considered one of the most influential books on the future of humans on Mars. The author describes how Mars should be governed by a cabinet of 10 men, the leader of whom would be elected every five years.